Whip up a pair of Rasta socks in a jiff! These super adorable socks by Liat Gat of KnitFreedom call for just one skein of Rasta, a staff and store favorite. 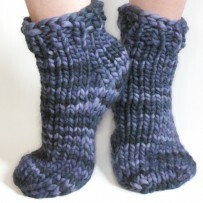 This is a great beginner sock that you can make in a day! You can make these one or two at a time using magic loop.